Loyal and confident, the Boxer is a loving breed that can serve as an excellent household companion. Back in the day, these versatile and athletic pups were known as obedient workers and attentive partners which are still their prized qualities even to this day. The Boxer is one of the most beloved dog breeds in the United States currently ranking as the 10th most popular dog by the American Kennel Club. With such a high popularity, it’s no surprise why so many households bring home a Boxer as their new addition to their family. If you are considering adopting a Boxer as well, do some extra research to make sure you know exactly what you’re getting yourself into. Although the Boxer works for most households, their high activity requirements and hyper personalities can be overbearing for an inexperienced owner. These dogs require constant attention and exercise to stay both physically and mentally at their best. As a responsible pet owner, you must make sure you are able to fulfill all a Boxer’s needs before bringing one home. To further your research on Boxer personality and characteristics, continue reading our complete guide below. This article will highlight this breed’s early history, their temperament, personality, and even go over all the factors that contribute to a Boxer’s behavior. By the end of this article, you will be an absolute pro in everything you need to know before bringing home this four-legged friend. 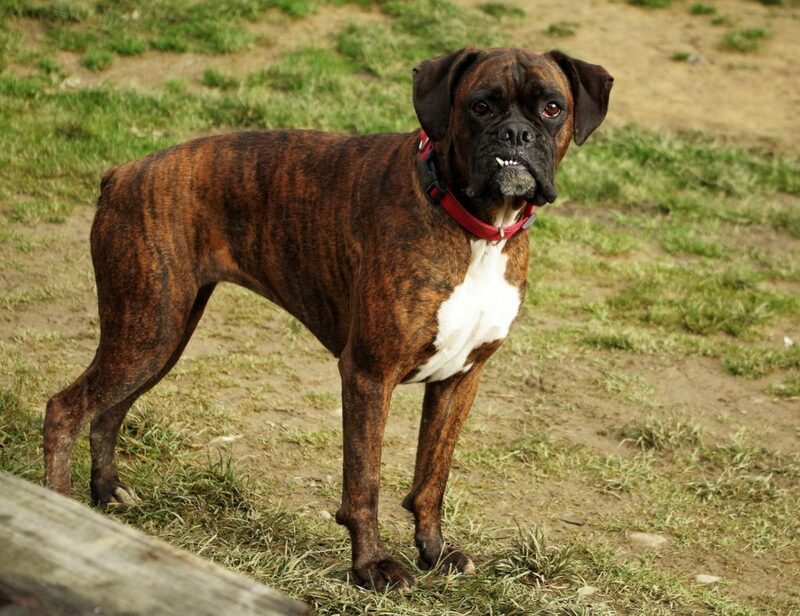 Originating from Germany in the late 19th century, the Boxer served as a working breed and a loyal companion. Many historians believed the boxer was a descendant of the Bullenbeisser, Mastiff, and possibly even the Bulldog. All of these dogs were characterized by their exceptional working skills which were later passed down to the Boxer breed. Unfortunately, the early history of the Boxer was not a very pleasant one. They were initially used for bull baiting which was a gruesome and horrific sport that involved torturing and killing a bull for entertainment purposes. Luckily, by 1835, bull baiting was banned, and the game became extinct. After their brief period of bull baiting, the Boxer took on a different role as a working dog. This time around, the Boxer was used as butcher’s helpers throughout many slaughterhouses in Germany. The main duty of the Boxer was to control and guide the cattle through the slaughterhouse and perform any other job that they needed to be done. By the end of World War I, the Boxer breed finally expanded beyond Europe and was brought to the United States. By the year 1904, these dogs became an officially recognized breed by the American Kennel Club which sparked their population across every state. Since their introduction in the early 1900’s, the popularity of the Boxer has skyrocketed exponentially and is now within the top 10 most popular breeds in the entire country. At first glance, you might assume the Boxer is an aggressive and imposing breed just by their appearance. However, once you take a second look, you will see their playful spirit and welcoming demeanor hiding behind their muscular build and commanding presence. Once a Boxer is comfortable with someone, they become the most lovable and affectionate companion. In fact, they have even been nicknamed as the “Peter Pan” of dog breeds due to their protective yet sincere qualities. The typical Boxer exhibits a similar personality from one another that is highly sought after for many pet owners. They tend to be courageous, loving, and energetic, all while being loyal and affectionate towards their family. If you are considering to adopt this breed, make sure you have a flexible schedule that allows you to spend plenty of time with your ppup. The Boxer thrives on human companionship and does not like to be left alone for long periods of time. If they are left for hours on end, there is a very high possibility that they will develop behavioral issues later on in life. If you have a family with children, the Boxer can be an excellent addition to your household. They’re playful yet patient, making them the perfect playmate for any youngster. The Boxer’s protective instincts and natural intelligence allow them to adapt quickly to any situation, meaning they will have no issues living in an active and busy household. As long as they have been properly trained from a young age and know how to interact in a family setting, these dogs can serve as an excellent furry friend for any type of family. Due to their independent qualities from their early years of working, a Boxer tends to have a mind of their own that can be challenging to tame. In order to get past this stubbornness and establish yourself as the leader of the household, make sure to start the training process as early on as possible. If a Boxer has not been properly trained, they will think that they are the boss and will go on as they please, completely disregarding any commands from their owner. Training can be a difficult challenge for these dogs, especially if you get a hyper and giddy puppy. With that being said, once they’ve had consistent training and practices, you should have a well-behaved companion in no time at all. As long as you devote your time and patience to dog training efforts, you will be happily rewarded with a well-behaved pup. Before we dive into the Boxer dog temperament, it’s important to note that not all Boxers will behave the same way. Their character may vary depending on a number of different factors. Generally speaking, the Boxer can be very welcoming to guests as long as they are carefully approached. On the flip side, they can also be an excellent guard dog and will alert their owners to the first sign of an intruder. If they feel their loved ones are being harmed in any way, they will sound the alarm and notify everyone that something is wrong. Between their ferocious bark and muscular appearance, you will always feel safe while having a Boxer in the household. As said before, the Boxer is an intelligent breed, but they need continuous training and mental stimulation to develop good behavior. If the Boxer doesn’t feel like they are being challenged with their training practices, they will lose interest and find something better to better to do with their time. Avoid this from happening by following these dog training tips and keeping the practices short, fun, and engaging on a consistent basis. Something that is also unique to the Boxer breed is that the males and females tend to display different temperaments. Males are known to be more social, affectionate, and playful while also having a youthful spirit that lasts well into their adult years. Females, on the other hand, are more protective of their loved ones and are more introverted than most males. No matter if you end up with a female or male, both options can be excellent household pets with the proper training and socialization. A Boxer’s temperament and personality can drastically change depending on the physical activity they receive on a daily basis. Most boxers are known to be very active and require a substantial amount of exercise. With such an athleticism and high energy level, the Boxers need a daily outlet to serve as their release. That’s why runs and long walks are a must for these dogs to stay both happy and healthy throughout their lifetime. Even while they are still a puppy, it is essential that the Boxer gets at least 45 minutes to an hour of exercise a day. The best situation is if the Boxer has a spacious, fenced-in backyard where they can run and frolic as they please. Just like with any breed, the Boxer dog personality and temperament is dependent on several factors. Socialization of your dog, training, nutrition, and genetics are all components that contribute to your Boxer’s defining characteristics. If you want your Boxer to feel comfortable in everyday situations and to be outgoing with family and loved ones, then it’s imperative that you socialize your dog at a young age. When a Boxer is properly socialized, they will have more of an extroverted personality and will understand how to deal with daily situations. Expose your dog to new people, places, and experiences as young as possible. Whether it’s a trip to the dog park or a quick ride in the car, partaking in new situations will ensure that your Boxer will become a well-mannered pup later on in life. As we already know, the Boxer is not the easiest breed to train. However, it is also not an impossible task to achieve if you have enough patience and consistency. As their owner, it is critical that you establish yourself as the leader of the household. Since these dogs tend to be independent, they will ignore all commands if the proper respect has not been established during their young age. Another essential element to training a Boxer is to use positive reinforcement to encourage good behavior. Boxers are known to lash out or develop unfavorable behavior traits if they have been treated harshly or scolded at any point during their training. Avoid this from happening by using praise, affection, and treats as your go-to reward system during all practices. Your dog’s temperament and personality can be significantly influenced by his overall quality of health. If he is not meeting his daily health requirements and is not being exercised on a regular basis, chances are your Boxer pup will develop behavioral issues that are hard to break. When it comes to your Boxer’s food, make sure to feed him a high-quality diet filled with all-natural ingredients. What you put into your pet’s body can have a major impact on his overall health, so that’s why it’s imperative to find a dog food that supports his growth and development. Professionals recommend staying clear of any products that contain a high level of preservatives, fillers, animal by-products or any other harmful ingredient that can have an adverse effect on your dog’s health. If you are looking for the perfect dog food for your pet, consult with your veterinarian for further recommendations. Unfortunately, not all factors that influence behavior can be controlled by the owner. When it comes to genetics, it really is a luck of the draw with the type of dog you end up with. However, one way to see your dog’s future personality traits is by meeting one or both of his parents. This will give you a reliable insight into the kind of Boxer dog personality you can expect. Another way to improve your chances of getting a well-behaved dog is by only adopting from a reputable breeder. Do not fall into the trap of buying your dog from a puppy mill. Irresponsible breeders take advantage of these popular breeds and reproduce dogs with no consideration to their overall health or potential genetic traits. When you bring home a dog that was bred from a puppy mill, you have no idea what kind of health issues or behavioral issues they may have until it’s too late. Make sure to always adopt from a reputable breeder that can show you health clearances from both of the parents. There are endless reasons why the Boxer is one of America’s favorite dog today. With their athletic build, playful spirit, and devoted loyalty, the Boxer breed serves as an excellent companion fit for many households. As his owner, if you want your Boxer to have favorable behavior qualities, don’t forget to socialize him, train him, feed him a balanced diet, and choose a breeder that is reliable. As long as you follow all of these tips and provide your dog with constant affection, you will be able to foster a beautiful relationship between you and your Boxer throughout his entire lifetime. “Boxer – Temperament & Personality.” Petwave, 16 July 2015, Accessed 12 Dec 2017. www.petwave.com/Dogs/Breeds/Boxer/Personality.aspx. “Boxer Dog Breed – Facts and Personality Traits | Hill’s Pet.” Hillspet, Accessed 12 Dec 2017. www.hillspet.com/dog-care/dog-breeds/boxer. “Boxer Dog Breed Information, Pictures, Characteristics & Facts.” Dogtime, Accessed 12 Dec 2017. www.dogtime.com/dog-breeds/boxer. Kasinger, Chona. “The Boxer Personality, Revealed.” Rover, 31 May 2018, Accessed 12 Dec 2017. www.rover.com/blog/boxer-personality-revealed/. Jensen, Elle Di. “A Boxer’s Behavior.” Pets, 14 July 2016, Accessed 12 Dec 2017. www.pets.thenest.com/boxers-behavior-5934.html.